*** update 01OCT18 *** Canine Hugo was laid to rest after a sudden and unexpected illness cut short his life. Hugo served the citizens of our nation with the U.S. Army in Afghanistan and the citizens of Bethlehem Township for the past three years. Hugo was six and one half years old. K9 Hugo is a Belgian Malinois who was acquired from the U.S. Military in 2015 after a tour of duty in Afghanistan. K9 Hugo's partner and handler is Officer Bryan Tollinger. This is Officer Tollinger's second K9 partner. He was previously partnered with K9 Aris, also a Belgian Malinois. K9 Hugo is currently certified as a dual purpose Patrol & Explosive Detection Dog. Some of K9 Hugo's duties include handler protection, suspect apprehension, searching for lost or missing persons and explosives detection. K9 Hugo also assists officers in clearing buildings in which a suspect might be hiding. 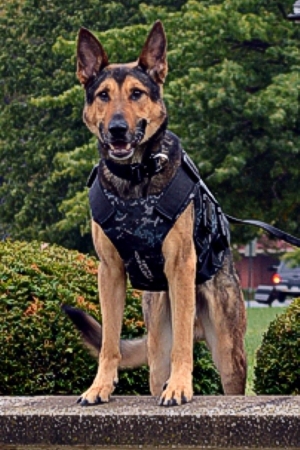 K9 Hugo is a tool with many functions that helps the Bethlehem Township Police Department and its officers "take a bite out of crime".